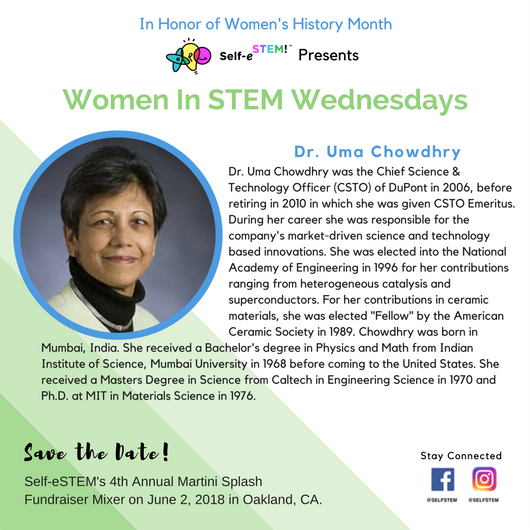 Dr. Uma Chowdhry was the Chief Science & Technology Officer (CSTO) of DuPont in 2006, before retiring in 2010 in which she was given CSTO Emeritus. During her career she was responsible for the company’s market-driven science and technology based innovations. She was elected into the National Academy of Engineering in 1996 for her contributions ranging from heterogeneous catalysis and superconductors. For her contributions in ceramic materials, she was elected “Fellow” by the American Ceramic Society in 1989. Chowdhry was born in Mumbai, India. She received a Bachelor’s degree in Physics and Math from Indian Institute of Science, Mumbai University in 1968 before coming to the United States. She received a Masters Degree in Science from Caltech in Engineering Science in 1970 and Ph.D. at MIT in Materials Science in 1976.